The American Boxer Club recommends these tests only apply to dogs in an active breeding program and each dog must be identified with a microchip. Use and interpretation of tests should be in consultation with your veterinarian or veterinary specialist. These guidelines will be updated as further knowledge is gained. All hearts should be ausculted at each veterinary visit. This is particularly important prior to any surgery, including ear cropping. If a murmur is detected the dog should be evaluated to determine the cause and significance of the murmur. Murmurs may be innocent ("flow" murmurs) or may be an indication of structural heart disease such as aortic stenosis, sub aortic stenosis, septal defects or defects of the mitral, tricuspid or pulmonic valves. Echo with Doppler measurements can accurately find and diagnose the origin of murmurs which cannot always be heard or reliably pinpointed by auscultation alone. 1. Maximum flow values have recently been reevaluated and raised to 2.4 IF there is no evidence of structural causes. The cardiologist should determine if the flow value for an individual Boxer is of concern. Current information is that AS/SAS may develop upon sexual maturity in dogs that were previously tested clear, thus the new recommendation for 24 mos. minimum age. 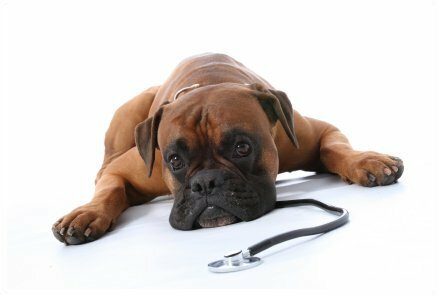 Boxer Cardiomyopathy is a complex condition that is still under study. 3. Because these results can change over time, or because the age at testing may be significant, it is essential to list the date of the most recent test in each case. There are no normal values for some of the recommended tests, and there can be differing opinions between experts in the field.